I was born and raised in Australia – where it is regularly over 35˚C (95˚F) on Christmas day. Hot Christmases are completely normal for me... and yet, I love the winter wonderland theme at Christmas time. I guess I am not the only one – our shopping centres display fake snow at Christmas even though all the shoppers are wearing thongs and shorts! 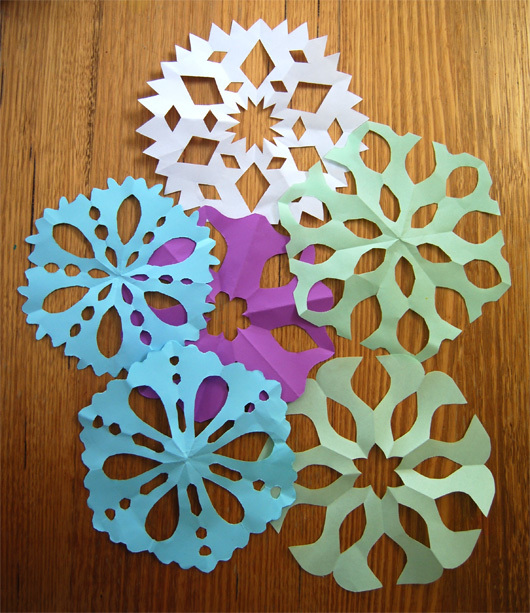 With Christmas approaching I was inspired to make paper snowflakes with the kids. I followed the instructions from Bon Temps Beignet. She does a brilliant job of explaining how to get the folds right so I am not going to do that here. My advice is to spend 5-10 minutes of non-kid time to get the first snowflake right. 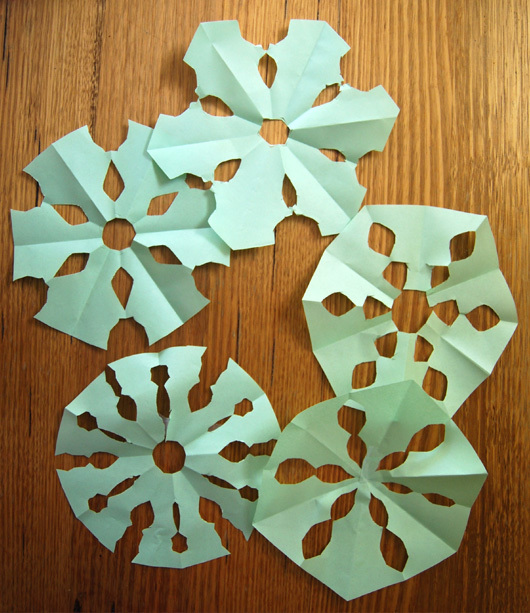 Once you have mastered one, it is easy and you will blow your kids' minds with your snowflake prowess! I fold the paper, I cut the paper, I hand the paper over to the first child to unfold, child unfolds the paper to reveal a stunning paper snowflake, mouths drop open, eyes go wide, second child yells "I want one, I want one".... repeat. I did have a roll of sticky tape nearby to fix any tears that were inflicted on the paper snowflakes during the 'unfolding'. Eventually Cakey wanted to make them herself. I had a stack of very thin, green paper which I folded for her. She was able to cut out the patterns herself which meant Boo could monopolise my snowflake output. (Last year we made a simpler and technically inaccurate version of a snowflake). After the snowflake craft was abandoned I was left with a bowl full of paper snowflakes. They were so pretty I tucked away my favourites and waited for inspiration. A few days later, a large roll of thick watercolour paper conked me on the head as it fell from a high shelf... it really did, honest. 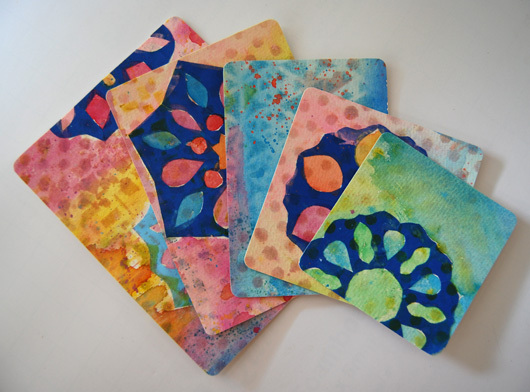 It gave me an idea – combine the snowflakes with the watercolour paper to make Christmas cards. 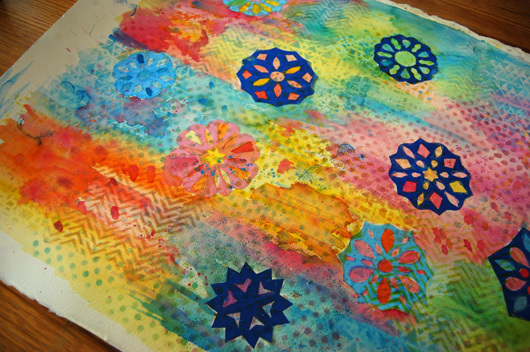 That evening I glued the snowflakes onto the watercolour paper and left it to dry. I had watched a video clip of Julie Balzer make a lovely layered stencilled design so I thought we could attempt something similar. 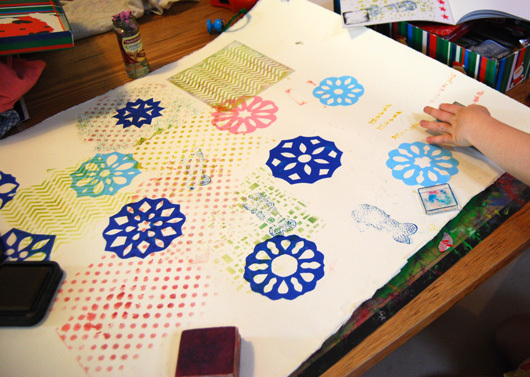 Cakey and I sat side by side and we stencilled patterns onto the paper with stamp pads and coloured ink. Cakey also added a few stamps of her own. They were blotchy and imperfect which suited us just fine. I was pretty darn excited with how this was turning out. Once the kids were in bed I borrowed their watercolour paints and added some colour washes over the top. I spent an afternoon cutting up the large decorative piece of watercolour paper. I turned it into Christmas cards and lots of different sized present tags. Cakey sat beside me and rounded the corners with our new corner cutter. Unfortunately we lost a few good ones... Boo is currently going through a "let's cut up everything with my new scissor skills" phase so a few of the tags were chopped up into tiny pieces before I noticed. This is a gorgeous idea! Love it. Pinning it. Happy holidays. This is stunning, Ali, and you're right that we were on the same page! I loved reading The story of how this unfolded. Isn't it crazy that you're celebrating winter wonderland in all that heat?? So weird hey! I guess everyone loves snowflakes. Thanks for visiting. 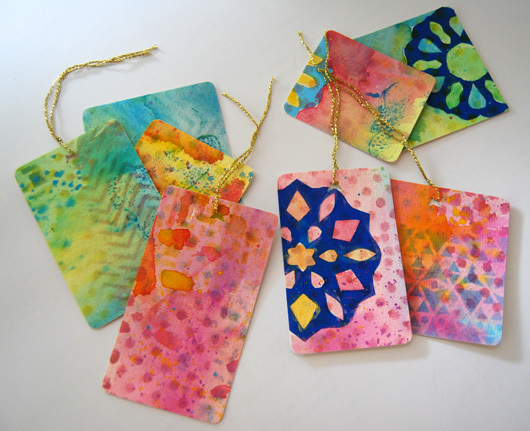 These are lovely, love that you took a kids craft and turned it into something really stunning. 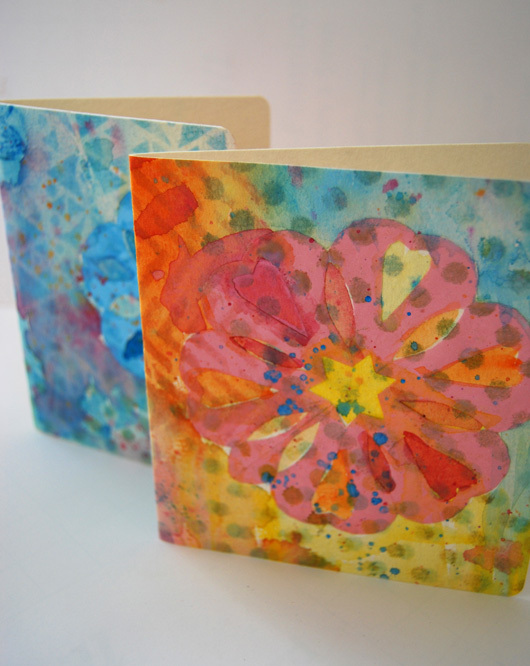 I took some potato printing we did and made it into cards, but the results are nowhere near as pretty as yours! These are amazing, I love love LOVE them!!! I love that you love them Aleacia. So glad to see you are back in the blogging world too. Thanks Juise. I hope you are going well. Oh how beautiful they turned out! I would love for you to add this to my weekly Mom's Library Link-Up along with any other of your great ideas. There's one going on now! Oh my goodness these look WONDERFUL!! I am so impressed. Gorgeous and off to pin. These are just stunning Ali....you sell those beauties!! Would have been nice framed too i am sure! Glad you didn't 'lose' too many to over excited cutting skills!! Oh my Ali, they're lovely! Thanks fo dropping by Amie. So true about the air con, it can make the heat outside so much worse. Homemade Christmas cards are so much more meaningful. Thanks for the tips - I'm sure my younger one will enjoy making these for his classmates. Oh! This is really beautiful. I love your snowflake cards, they are amazing! Thanks for sharing on the Kids Co-op, I am featuring them this week. I hope you stop by and link up again! Thanks Tammy, I really appreciate that. These cards are just lovely. Really impressive to see how the snowflakes worked their magic! Oh my goodness these are GORGEOUS Ali! Just popping back to let you know I've featured these on my blog today as part of my Kids Co-op post. These are so beautiful. Yes we are I will come over and link up. Thanks so much for visiting. great cards and tags!! i the pretty result.